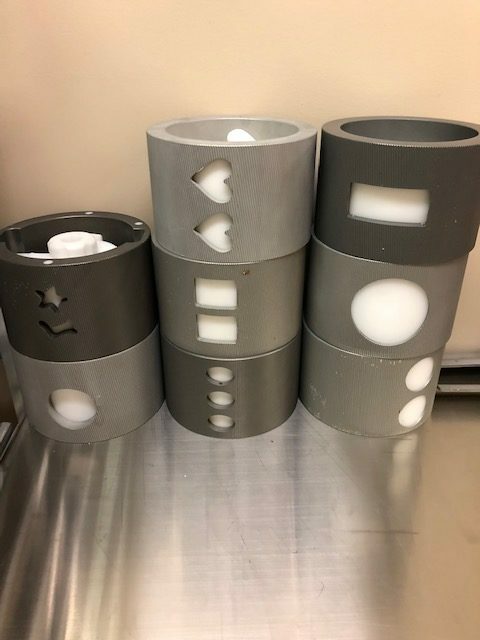 Able to handle a variety of batters with custom drums available providing shape/weight/size possibilities. 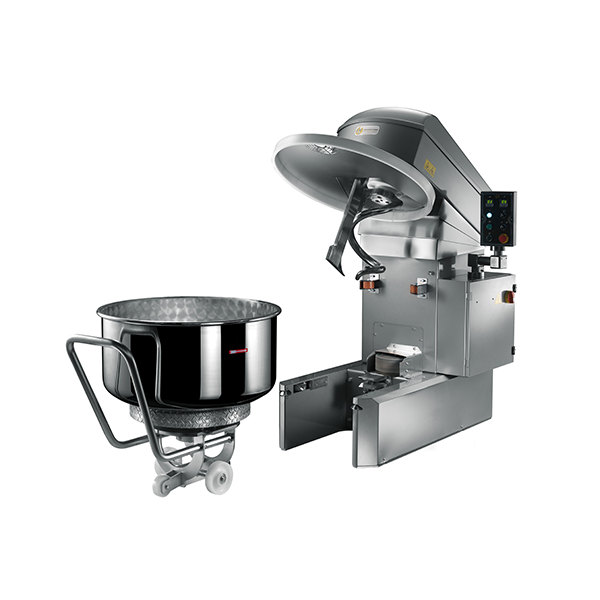 The B25 is designed for operation in bakeries requiring capacities in the area of 25 l/min (at an inlet pressure of approx. 3 bar) and an accurate temperature control. The B25 is easy and simple to operate. The required water quantity is set via the key-pad which is smooth and very easy to clean. The B25 can memorize up to 3 different water quantities/programs. An intermediate stop can be entered in each program. Temperature is set manually by means of a handle. 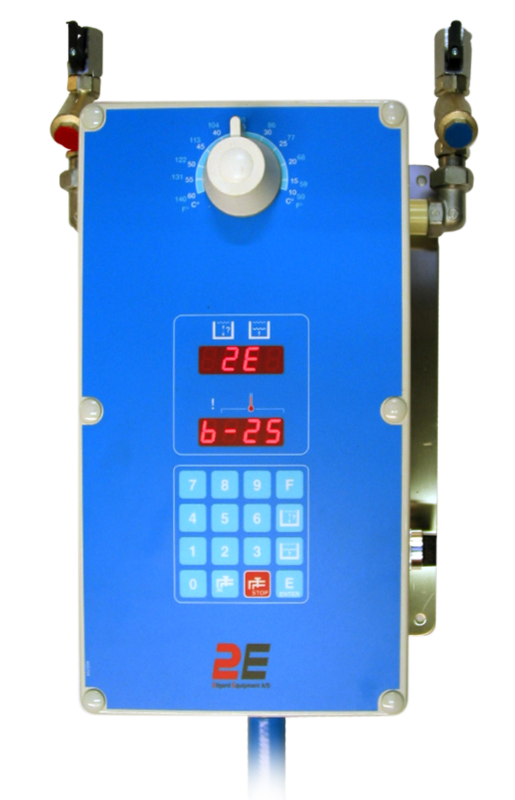 To displays shows the set water quantity and temperature, respectively, as well as any set intermediate stops, and during metering the actual quantity is continuously displayed. By means of a button for automatic intermediate stop, the quantity of water can be divided into two portions allowing for a pre-mix. 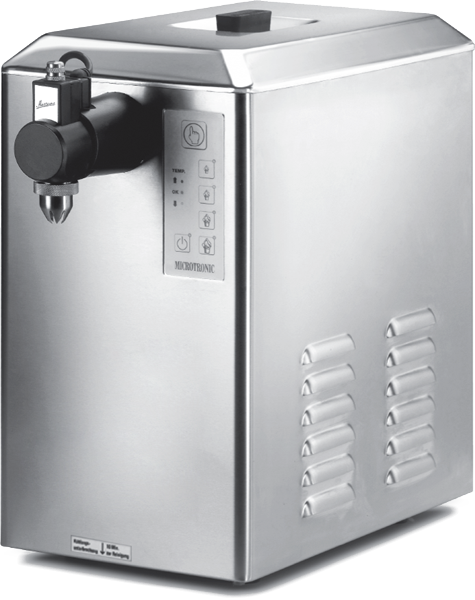 The water mixer has a repeat function meaning that you only have to press a button to repeat the latest metered quantity. Any interruptions of operation are easily identified by means of codes given in the temperature display. 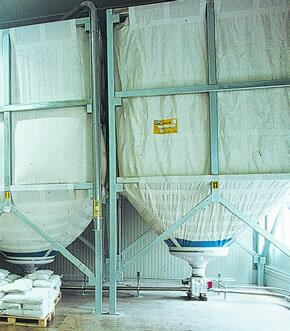 Indor silo series SILSYSTEM for food stuff in antistatic trevira fabric with built-in filtering roof. 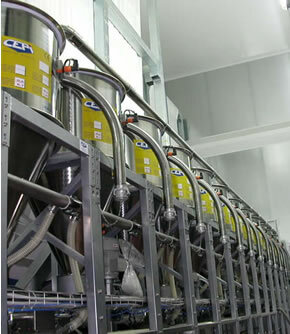 Silo is custom made and suited for powders of density up to 1,3 kg/liter. The modular structure in galvanized steel allows quick assembling and disassembling. CAPACITY: 1-70 Mc. designed for installation in sheltered environments with natural or forced ventilation. 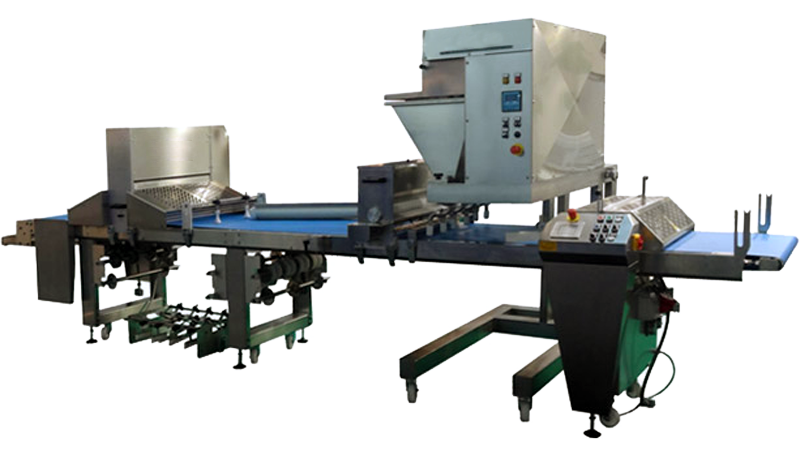 Indoor Big Bag Unloading System in painted or stainless steel, built with material suited to the storing and conveying of food stuff. Eases the emptying of Big Bags. Modular structures in stainless steel suitable for all room solutions. Built in high precision tin stainless steel, with anchoring bolts, 5 meters connecting cable and flexible support. Standard (10, 25, 50, 100, 150, 250, 500, 750, 1000, 1500 Kg) and custom weight. For silos and hoppers, built in stainless steel and equipped with limit switch to signal breaking. Mechanic for silo, built in stainless steel AISI 304. Maximum pressure: 270 mm circa, minimum pressure: 20 mm circa. Equipped with regulation bars with sigil and protection carter in steel. Connected to silos, allows active control of pressure in the loading from tank to silo. Built in steel alloy, inspection and cleaning are easy and quick, doesn’t break impurities. Equipped with quick hook, grill removable for cleaning, electrical three phase motor, joints, security limit switch, basket with body in steel fusion, centrifuge with body in steel fusion and inside brush. 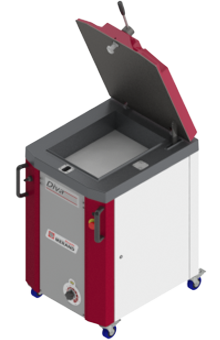 Deferrizzator on bags by gravity, built in stainless steel, equipped with magnetic bars in neodymium, with hatch for cleaning. Circuation pump for heating liquid, equipped with valves set for the by-pass, capacity: 500 lt/ h.
Centrifuge for egg mix type A 20 in stainless steel 304, equipped with 0.37 kw electric motor, motor’s careening in satin-finished stainless steel, quick joint for connection, valves set for the by-pass. Washing pump type cea 120/3v. Equipped with basis and three phases electical motor. 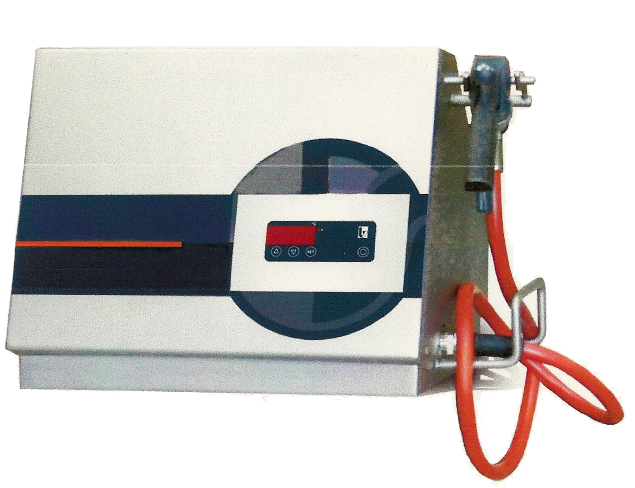 Magnetic centrifuge pump for brain, capacity: 280 lt/min. Monoscrew pump in stainless steel  cap: 1,7 mc/h with intercepting valves. Pump body is stainless steel aisi 304, rotor in stainless steel aisi 316. Valve for silo emptying in steel or cast iron. Equipped with gear motor, transmission chain and pinions, tin props on heads, protection carter. Valve for silo emptying with variable diameter to meet specific needs, with manual command equipped with control lever; or with electropneumatic control and 5 ways electrovalve. The valve is made entrely of stainless steel AISI 304. Pouring channel screw conveyor with standard or custom diameter and length, in painted or stainless steel. Equipped with self-aligning props on the heads and support in painted or stainless tubular. Centrifugal compressor in pressure for fluidification system. Equipped with manostat, filter, shelf, tire gauge and various connections. Three-phase electrical motor: 220/380 V – 50 Hz. Pneumatic conveying system composed by centrifugal compressor with asynchronous three-phase electrical motor, recovery filter for impurities equipped with protection, supersilencer with external careening in painted steel, antivibration prop, security valve equipped with tire gauge, manostat and non-return valve. Pneumatic conveying system in suction composed by centrifugal compressor, three-phase electrical motor. Equipped with security grill with joint, supersilencer with external careening in painted steel, tire gauge and antivibration prop. Filter for blowing unit equipped with cartridge, cartridge cover, joint for collection to blowing unit. 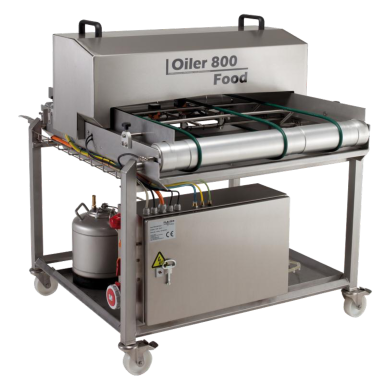 The machine was developed to oil baking trays and baking moulds uniformly, hygienically and economically. Compressed air is used to move the release agent to the spray nozzles via a pressure tank. 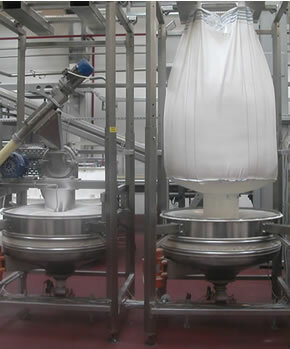 The release agent is applied by Airmix spray nozzles that were adapted for the food industry. 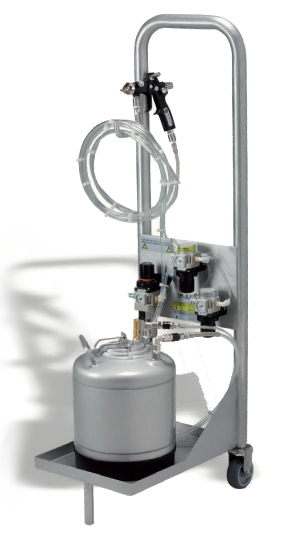 The oil quantity can be dosed precisely using adjustment screws and can be set between approx. 1 and approx. 12g per baking tray. 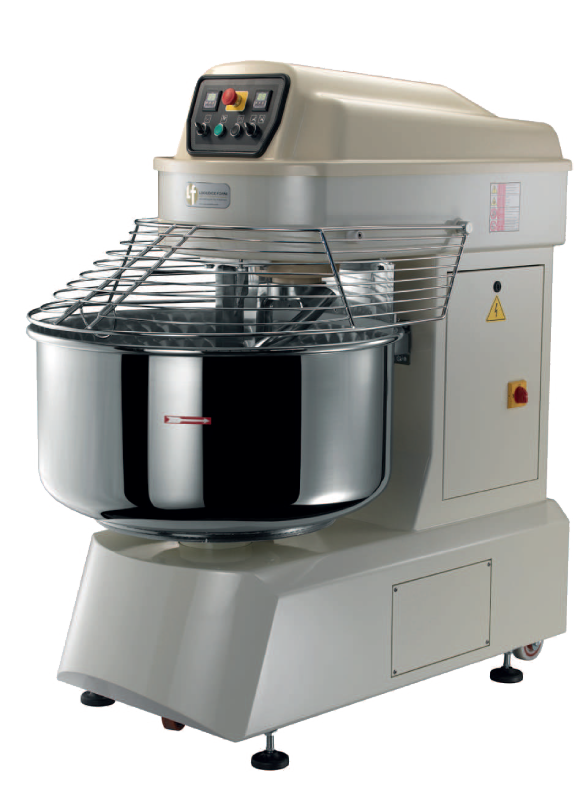 To reduce release agent consumption, a control is used to spray the baking tray precisely. can be used for spraying. The spray nozzles can be set so that there is virtually no spray vapour. 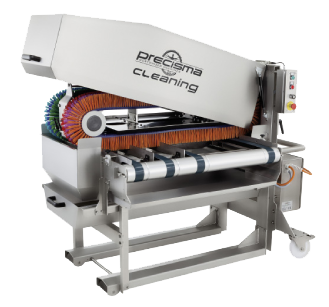 The machine was developed specifically for cleaning profiled baking trays such as baking moulds, baguettes and baking trays with 2, 3 and 4 edges. It is best suited for removing flour dust, sesame seeds, poppy seeds and lightly baked-on dough remains from the baking tray. Cleaning occurs via belt brushes that rotate at a right angle to the direction of travel. The brushes can adjust optimally to the baking tray’s contours, and the baking remains are transported sideways from the baking tray. The belt brushes move in opposite directions to each other so that dents, depressions, pits, etc. are also cleaned. 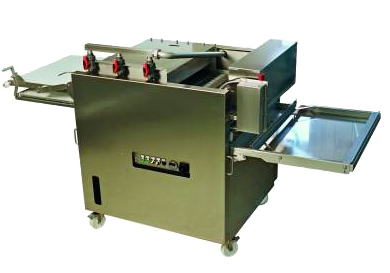 Hydraulic divider MERAND Diva has a square tank, therefore you can divide the dough into 20 equal divisions. 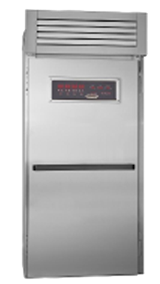 Its strong design guarantees the MERAND Dough Divider reliability. Every detail is designed to provide comfort, make it easy to clean and very respectful of dough. 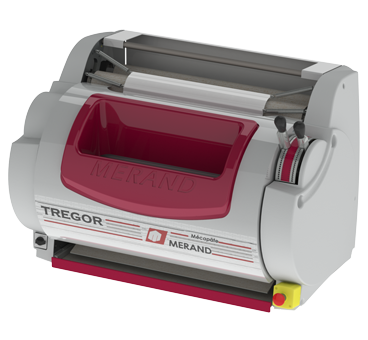 This divider can also be upgraded to become a divider-shaper MERAND. Exclusive MERAND Systems can be added to fit extra requirements such as : APF®, Non Flour Splatter / FlourBox®, removable flourbox / Variopress®, pressure sensor according to dough type / EasyDoors®, safe and easy cleaning system without tools / FlexiTable®, foldable worktable. *tank capacity is dependent on dough type/density and are guidelines only. Note in Div X mode the variety of grids will determine your quantity of dough pieces and total dough capacity. Watch video of how easy it is to perform a daily cleaning using the Mussana Microclean Powder! using Vapor Tube Technology — giving even heat distribution and retention. 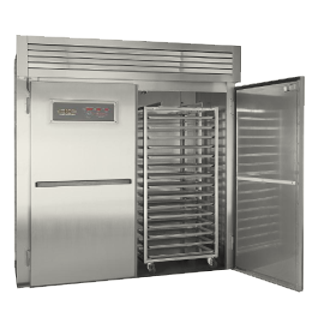 Separate steam generators for each individual baking chamber positioned in the lower part of the oven in direct contact with the hot air flow generated by the burner. They guarantee large quantities of steam with very fast recovery times. full glass doors for easy viewing. Stainless steel front and external covering. Quick recovery and temperature change. Available in gas or diesel oil versions. Low consumption of fuel and energy. 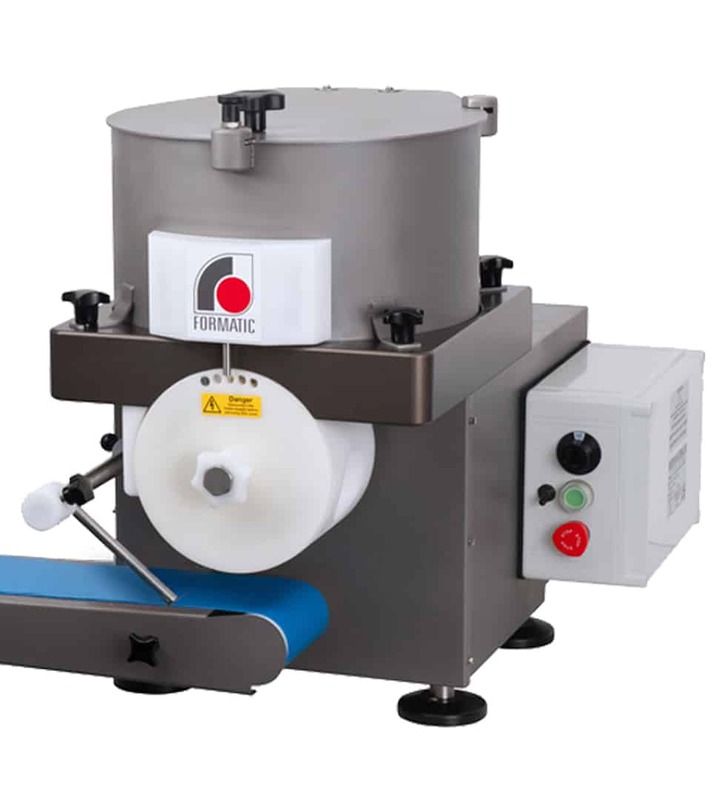 Machine to roll and to shape dough balls with weight from 50 grams (1.76 oz) to 1 450 grams (3.19 lb). 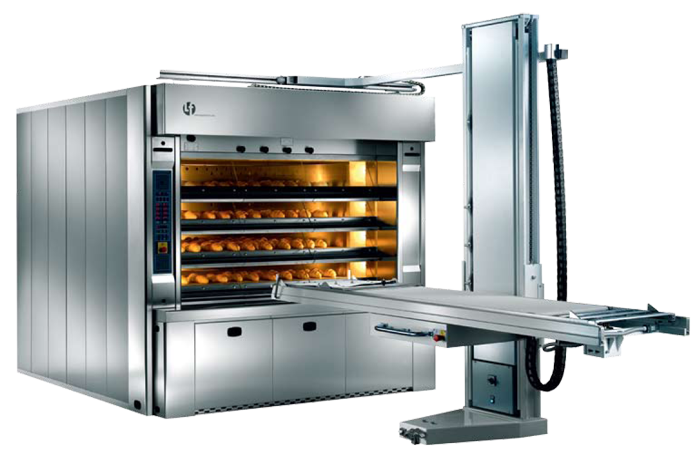 The Production rate is up to 1 800 parts per hour depending on the dough ball weight. 2 pointed selector for laminating and lengthening adjusting. Stretching system between two moving belts (compact machine). 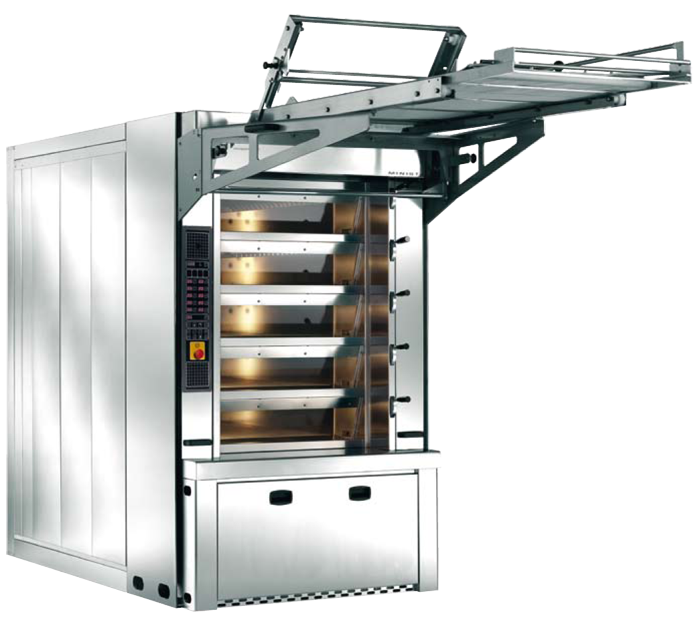 EVENNESS and QUALITY IN BAKING, combined to an extraordinary rapidity on temperature variation are the results of the technology applied to the traditional system of the annular steam tube ovens. External and single cross Manessman tubes, resistant to high pressure have an external diameter of 27 mm and thickness of 4 mm. The absence of bricks and cement in the fire room allows to reduce the weight and slightly the dimensions of the oven itself. Hot air flues are manufactured of refractory steel cylinders, high temperature resisting. All tube assembly is insulated with a light but of high coefficient of insulation material. 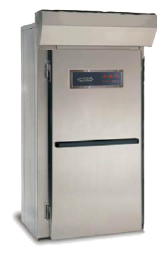 Quickly reacting where an increase of temperature is demanded and above all very economical in fuel consumption compared to other steam tube ovens. producing a large quantity of steam. Individual steam generators for each deck. 2, 3 & 4 door design, up to 5 decks. Tempered glass doors with counterweight. 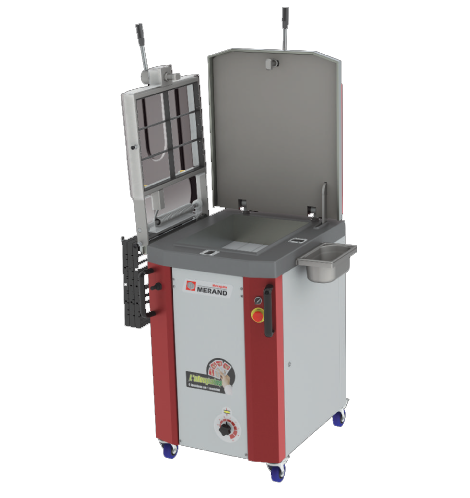 Highly customizable make-up tables, designed to be easy to use and effective, with high output, rapid format change, a simple sanitation.